The Ultra-royalists (French: Ultraroyalistes, also called as Ultras) were a French political group active from 1815 to 1830 under the Bourbon Restoration. The Legitimists, another of the main right-wing families identified in René Rémond's classic opus Les Droites en France, were disparagingly classified with the Ultras after the 1830 July Revolution by the victors, the Orleanists, who deposed the Bourbon dynasty for the more liberal king Louis-Philippe. Ultraroyalist also refers to "someone who is a very strong supporter of royalism." 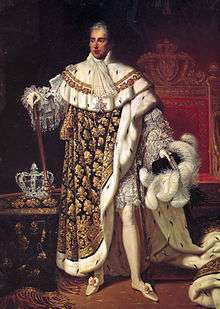 Charles X in his coronation robes. Charles' personal philosophy was more in line with the Ultras than Louis XVIII's had been. Inaugurating the Bourbon Restoration (1814–1830), a strongly restricted census suffrage elected to the Chamber of Deputies an ultra-royalist majority (la Chambre introuvable) in 1815-1816, and again from 1824 to 1827. Known to be "more royalist than the king" (plus royalistes que le roi), the Ultras were the dominant political faction under Louis XVIII (1815–1824) and Charles X (1824–1830). Opposed to the limitation of the sovereign's power under the constitutional monarchy, they hoped to restore the Ancien Régime and annul the rupture created by the French Revolution. Passionately espousing the ruling ideology of the Restoration, the Ultras opposed liberalism, republicanism, and democracy. While Louis XVIII hoped for a moderate restoration of the Ancien Régime, acceptable to the masses who had participated in the Revolution, the Ultras held rigidly to the dream of an 'integral' restoration. Their power was due in part to electoral laws which largely favored them: on one hand, a Chamber of Peers composed of hereditary members, on the other hand, a Chamber of Deputies elected under a heavily restricted census suffrage of approximately 100,000 voters. Jean-Baptiste de Villèle, Ultra-Royalist prime minister of France from 1821 to 1828. In 1815, an Ultra majority was elected to the chamber of deputies. Louis XVIII dubbed them La Chambre Introuvable, which translates as 'the impossible chamber,' due to his astonishment at a group of deputies more royalist than himself. Under the guidance of his chief minister the duc de Richelieu, Louis XVIII finally decided to dissolve this turbulent assembly, invoking Article 14 of the Constitutional Charter. There followed a 'Liberal Interlude' from 1816–1820, a period of 'wilderness years' for the Ultras. Then on 13 February 1820, the Duke of Berry was stabbed by a republican assassin as he left the Paris Opera House with his wife and died the next day. This outrage strengthened the Ultras, who then introduced laws such as the Law of the Double Vote which allowed them to further dominate the Chamber of Deputies. In addition to other factors, Louis XVIII's health was in serious decline, reducing his resistance to Ultra demands: even before he came to the throne, the Comte d'Artois (Charles X) already dominated the government. The 1824 death of Louis XVIII, whom they saw as too moderate, lifted the spirits of the Ultras: they expected their leader, the new king Charles X, would soon become an absolute monarch, answerable only to God. In January 1825, Villèle's government enacted the Anti-Sacrilege Act, instituting capital punishment for the theft of sacred monstrance vases (with or without consecrated hosts). This "anachronistic law" (Jean-Noël Jeanneney) was never seriously applied and was repealed in the first months of Louis-Philippe's reign (1830–1848). The Ultras also wanted to create courts to punish Radicals, and passed laws restricting freedom of the press. The 1830 July Revolution replaced the Bourbons with the more liberal Orleanist branch, and sent the Ultras back to private life in their country chateaux. They retained some influence, however, until at least the 16 May 1877 crisis, and even further. Their views softened, their principal aim became the restoration of the House of Bourbon, and they became known from 1830 on as Legitimists. The historian René Rémond has identified the Legitimists as the first of the 'right-wing families' of French politics, followed by the Orleanists and the Bonapartists. According to him, many modern far right movements, including parts of Jean-Marie Le Pen's National Front and Lefebvre's Society of St. Pius X, should be considered as parts of the Legitimist family. ↑ Ultraroyalist. Dictionary of Politics and Government, 2004, p. 250.